The bundle includes all four elements of The Perfect Shave®, Pre-Shave Oil, Shaving Cream, a Shaving Brush, and our After-Shave Balm. The 4 Elements of The Perfect Shave combine The Art of Shaving's high quality products, handcrafted accessories and expert shaving technique to provide optimal shaving results while helping against ingrown hairs, razor burn, and nicks and cuts. The bundle offers Pre-Shave Oil (2 fl. oz), Shaving Cream (5.0 oz), After-Shave Balm (3.3 fl. oz), and a Genuine Badger Shaving Brush. Unscented Pre-Shave Oil 2 oz. Unscented Shaving Cream 5 oz. Before shaving, rub a small amount of oil on your hands and massage into the beard. Lather up Shaving cream or soap on top of the gel and shave. Always shave during or after a hot shower. Using hot water, lather up a small amount of Shaving Cream with a brush or your fingers and shave with the grain. For a closer shave, re-lather and shave lightly across or against the grain. Rinse with cold water and apply After-Shave Balm. 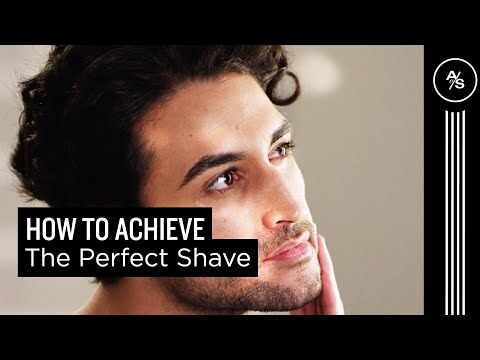 Apply to face and neck after shaving. The Art of Shaving ingredients are updated as frequently as possible. Please refer to the ingredient listing on the packaging of your product to ensure all ingredients are suitable for your needs.